We’d love your help. Let us know what’s wrong with this preview of Runaway by Peter May. In 1965, five teenage friends fled Glasgow for London to pursue their dream of musical stardom. Yet before year's end three returned, and returned damaged. In 2015, a brutal murder forces those three men, now in their sixties, to journey back to London and finally confront the dark truth they have run from for five decades. Runaway is a crime novel covering fifty years of In 1965, five teenage friends fled Glasgow for London to pursue their dream of musical stardom. Yet before year's end three returned, and returned damaged. In 2015, a brutal murder forces those three men, now in their sixties, to journey back to London and finally confront the dark truth they have run from for five decades. To ask other readers questions about Runaway, please sign up. The final straw for young seventeen year old teenager Jack MacKay was his expulsion from school after a particular incident at a school dance. He was a member of the group Shuffle with friends Maurie, Luke, Dave and Jeff; their great love of the music of the 60s stirred a longing of their own – at fifteen Jack had formed Shuffle and they hadn’t looked back. But being expelled from school proved to be the catalyst in his life – running away from his home in Glasgow to London was his idea; his fri The final straw for young seventeen year old teenager Jack MacKay was his expulsion from school after a particular incident at a school dance. He was a member of the group Shuffle with friends Maurie, Luke, Dave and Jeff; their great love of the music of the 60s stirred a longing of their own – at fifteen Jack had formed Shuffle and they hadn’t looked back. But being expelled from school proved to be the catalyst in his life – running away from his home in Glasgow to London was his idea; his friends decided the group needed to stay together, so the five of them ran away in 1965 – never realizing the change it would bring to their lives, and not in a good way. The adventure and misadventure; the fun and panic-filled adrenalin that those five young friends discovered on their tenuous journey to London – none of it was quite as they had envisioned their start in the music industry. The awe they felt on their arrival in London though was inspiring; seeing both John Lennon and Bob Dylan – but would Jack and his friends get a break into the music industry? Fifty years later the report of a brutal murder which Maurie saw in the local newspaper brought the past rushing back to them. Maurie was a sick man by this stage, but he was determined to return to London to face the past; to face the truth of what had happened all those years before. Jack and Dave, along with Jack’s grandson Ricky joined Maurie in their quest for answers. But was it a mirror image of their bolt to London fifty years prior? What would the three friends and a bemused young grandson find in a London that was changed; but not changed? I thoroughly enjoyed Runaway by Scottish author Peter May; my first by this author but most definitely not my last! A gripping crime novel, filled with fast paced, heart thumping tension; plus intrigue, emotional nostalgia and flashes of humour throughout. Told in the two timelines of 1965 and 2015 it worked incredibly well in showing the differences fifty years makes. I have no hesitation in recommending Runaway very highly. With thanks to TRR and Hachette Australia for my copy to read and review. As much as it pains me to draw on the words of Forrest Gump, Peter May’s writing is like a box of chocolates- you never know what you’re going to get. From the brilliant Enzo Files series, to the China thrillers, to, the wonderful Hebridean trilogy, and the haunting standalone Entry Island, May consistently demonstrates his flexibility as a writer, instilling total belief in his characters and locations for us gentle readers. Runaway proves itself an excellent addition to his multifarious back c As much as it pains me to draw on the words of Forrest Gump, Peter May’s writing is like a box of chocolates- you never know what you’re going to get. From the brilliant Enzo Files series, to the China thrillers, to, the wonderful Hebridean trilogy, and the haunting standalone Entry Island, May consistently demonstrates his flexibility as a writer, instilling total belief in his characters and locations for us gentle readers. Runaway proves itself an excellent addition to his multifarious back catalogue, and drawing so closely on his own life experiences gives us a delightful insight into the background of one of Britain’s finest crime writers. 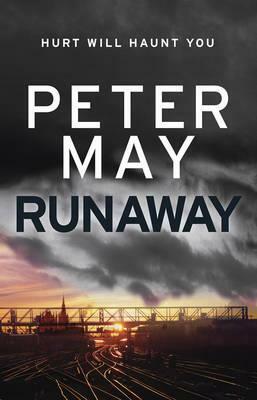 Runaway is the seventh stand-alone novel by Scottish journalist, screenwriter and author, Peter May. When seventeen-year-old Jack MacKay makes a sudden decision, in 1965, to escape Glasgow and head for London, he is surprised that his four friends are ready to drop everything and become a runaway too. Each has his own reasons, but all are convinced their band, The Shuffle, can make it big in the Big Smoke. But events don’t follow the script they have written: some months later, Jack and two of the band return to Glasgow to nurse their emotional (and physical) wounds. May runs the two narratives in tandem: events in 1965 are told by Jack in the first person; those in 2015, in the third person. They have various elements in common: runaways using “borrowed” vehicles; pursuit by disapproving family; diversions off the A74; an inconvenient loss of goods and transport through theft; and a certain money belt. May perfectly evokes the feel of the times, both the sixties and the present day. His wide-eyed, naïve lads and his cranky old men are completely convincing, his pacing is faultless and his plot twists are brilliantly conceived. The banter between the characters has a genuine feel and there are plenty of laugh-out-loud moments on both road trips. May gives the reader some marvellous prose and his descriptions are beautifully evocative: “…I grew up in Glasgow in the fifties and sixties, two decades that morphed from sepia to psychedelic before my very eyes as I segued from childhood to adolescence” is one example. While readers of a certain vintage will enjoy the nostalgia, fans of May’s work will not be disappointed, and new readers are sure to seek out his backlist. Funny, moving, and thought-provoking, this is an exceptional read. With thanks to The Reading Room and Hachette Australia for this copy to read and review. Runaway opens in 2015 with a murder in a downmarket room in London. Few would remember the name of the aging victim, former actor, Simon Flet, except Maurie. Fifty years earlier five starry-eyed 17-year-olds playing in a band together, were runaways from Glasgow, following their dream of finding fortune in Swinging Sixties London. Now, as he lies dying of cancer in a Glasgow hospice, Maurie contacts Jack and Dave, to make a final desperate journey to London to put things right. Jack enlists the help of his grandson, Ricky - a brilliant young man who sleeps by day and plays violent video games at night - to drive the three down to London. Fifty years earlier it was the parents who agonised, now it is their own children. The truth of what happened back in 1965 gradually unfolds, of the predators awaiting them as, while competent musicians, the band has no particular charisma or talent of their own. Their story is pitted against a background of gang violence, experiments in social housing and drug-therapy, to the widespread closures of unprofitable railway lines under the Beecham scheme - once the lifeblood of the Victorian era, superseded by cars and motorways. The housing around us became more sparse, and up ahead I saw that the street lights came to an abrupt end, leaving only darkness beyond them. Fear sat among us like another passenger. It could only be a matter of time before Andy made his move. Each had their own reason to leave and their experiences test the bonds of friendship, eventually taking a tragic turn. Of the five who left Glasgow, only three will return. The second journey in 2015 with an ailing Maurie in many ways reflects the first, with flashes of humour and heart-wrenching sadness along the way. But for me it is the quiet achiever, Luke, who silently steals the show. The plot takes place on two separate timelines, 1965 and 2015. As a baby boomer in his late teens in 1965 this part of the plot resonated so strongly for me. It so replicated my own life it could have been my biography. But my experience of the 1965s was a lot less traumatic than the young men in this story, I am glad to say. Five very young men, disillusioned with life in Glasgow, decide to leave home and seek fame and fortune in London. Just a note left, for unsuspecting parents, to say goodbye. Nothing, of course, goes to plan. For all of them this will be a life changing journey. Some will benefit from the journey but some will never recover from it. After a few months of traumatic living in London most of the boys make the decision to return home to Glasgow and their worried parents. Fifty years later one of the adventures, now dying from terminal cancer, wants to do the journey again. He has unfinished business in London and want to put it to rest before he dies. So with the help of his best friends, now all old, the trip is once again undertaken. The trip is a replica of the 1965 trip but this time seen through the eyes of older and wiser heads. This was such a joy to read. Peter May captures the essence that was the swinging 60s so perfectly. Add to that the dark underbelly of London of that time and what you have is a compulsive reading experience. Highly recommended for baby boomers and anybody else who enjoys a good read. A remarkable read! A well-constructed narrative that deals with two time settings, the earlier time frame – the late 1960’s – Glasgow and London and events there that had far reaching implications for all those involved and then the decision to revisit the past; in all its glory, with its downfalls, its sadness, naivety, bleakness and the loves, friendships and hope. 2015 sees the world through aging eyes and rights still have to be made, restitution paid. Crimes have been committed. The scales A remarkable read! A well-constructed narrative that deals with two time settings, the earlier time frame – the late 1960’s – Glasgow and London and events there that had far reaching implications for all those involved and then the decision to revisit the past; in all its glory, with its downfalls, its sadness, naivety, bleakness and the loves, friendships and hope. 2015 sees the world through aging eyes and rights still have to be made, restitution paid. Crimes have been committed. The scales need to be balanced. The settings are finely drawn. The characters believable, three dimensional and empathetic. I love their mission, and the ending has more than a few twists. This is more than a work of crime fiction, this is more than just a contemporary narrative, this is more than the sum these elements … so much more. This is a story of life, of death, of adventure, of the potential of youth and the potential of older age and mostly this is the story of enduring friendships. And this is about pain, without pain you have nothing. When Jack Mackay is expelled from school, he decides to run away to London. He tells his friends, the other four members of the band he plays in, and they decide to go with him – partly to get away from problems in their own lives, and partly to seek fame and fortune. It's 1965, and London is swinging – the place to be for all aspiring musicians. But it's also a place where young people can find themselves manipulated and used, and caught up in events they can't control. And Jack's London adventure ends with a killing. Fifty years on, one of the band members, Maurie, now terminally ill with cancer, reveals that the person everyone thought was the killer was innocent, and that he knows who really did it. He persuades Jack and Dave, the two remaining band members still living in Glasgow, to go back with him to London to put things right while there's still time. The publicity blurb for the book tells us that parts of the story are based on May's own experiences of running away to London as a teenager. As with his last few books, this one has a double timeline. The story of the '60s London trip is told by Jack in the first-person, while the present day section is third person, though still very firmly from Jack's perspective, and both sections are written in the past tense. Though we know from the beginning that someone is murdered, we don't know who or why until near the end, so this has more of the feel of thriller than a mystery. We also know that Maurie knows whodunit, so there's no investigation element. Instead what we have are two linked but very different stories of the characters heading to London, and the gradual revelation of what happened to the boys in the earlier storyline once they got there. Both timelines have a great feeling of authenticity and, as always with May, the sense of place is done superbly. I hadn't realised May grew up in the Southside of Glasgow (as did I), but the accuracy with which he describes it suggests he must have done. Although he's writing about a somewhat earlier era than my own, the places, attitudes, language and lifestyle are all spot-on. Spookily so, in fact – I kept finding parts of my own life mirrored in the story and spent much of the early part of the book being reminded of events and places in my own past. The two journeys, 50 years apart, allow May to show the changes across the country in that time, and he does so very well. Both journeys take the form of road-trips, punctuated by accident and disaster, but lifted by a healthy dose of humour. Along the way, the boys rescue Maurie's cousin from her drug-dealing boyfriend and she becomes one of the gang as they finally arrive in London and start looking round for the streets paved with gold. And at first, when they are given lodgings and a job by a man who promises them a chance to cut a demo disc, it looks as though they have landed on their feet. But it's not long before things go wrong and start to spiral out of control. The trip undertaken by the older version of the men in the present day is filled with a mixture of nostalgia and humour. It's through Jack's reminiscences during this trip that we see the earlier story unfold, and see him reassessing with the eyes of experience the risks to which his younger self laid himself open. Gradually we see how his whole life has been affected by the things that happened back then, with this trip giving him a chance for some kind of resolution and even redemption. The one weakness of the book for me was the crime element itself. The murder and motive for it weren't quite strong enough to justify the lengthy lead-up – in fact, it felt a little as if it had been tacked on to justify the book being classed as a crime novel. The strength of the book is in the relationships between the boys as they face up to the realities of life; and later between the men as they come to terms with the events that had such an impact on each of their lives. The ending felt a little contrived to bring the whole thing to a neat conclusion. Glasgow 2015 and Jack Mackay is visiting his old friend Maurie at the latter’s request. They’ve been friends since they were boys but haven’t seen each other for years, and now Maurie is dying. He wants Jack to take him to London. Someone from their past has been murdered and Maurie knows who killed him. He wants to put things right while he still can. In 1965 music loving teenagers Jack, Maurie, Dave, Luke and Jeff left their homes in Glasgow lured by thoughts of stardom and the bright lights in London. Jack had formed the band Shuffle with the other boys a couple of years earlier. Being expelled from school was the motivation for his decision to run away and his friends decided he wasn’t going alone. On the way they managed to get Maurie’s cousin, Rachel, out of a very bad situation, one that would have far reaching consequences, especially for Maurie and Jack. Things hadn’t worked out as the boys had hoped, and hard lessons were learned. It was a subdued party of three who returned to Scotland and settled for an existence far removed from that of their dreams. And so all these years later Jack enlists the very reluctant services of his grandson, Ricky, to drive them to London and back to the past. The narrative is well constructed with dual time lines running simultaneously, and moving seamlessly from one to the other. Peter narrates the events in the sixties from his perspective, while the present day is written in the third person. Evocative descriptions of 60s London with its colourful vibrancy and the exuberance and single mindedness of youth, contrasts sharply with the disenchantment of lives that didn’t meet expectations. Jack’s present day recollections of a time long gone unfold slowly and show how those past events have shaped all their lives, in most cases not for the better. J’évite les lectures "violentes" d’habitude mais je ne regrette absolument pas celle-ci, qui parle de nostalgie, d’amitié, de regrets, du temps qui passe et des erreurs qui nous hantent toute la vie. Je le finis la gorge serrée. Mention spéciale pour l’aspect "road trip" et le contexte des 60’s, décrit de manière très évocatrice par l’auteur - on s’y croirait ! Jack MacKay narrates our story, told in part in 1965 when as a young lad he ran away from Glasgow with a group of friends to see if the streets of London were paved with gold. The boys were in a band and they were determined to make a name for themselves, all eager to see the bright lights and to remove themselves from various difficult situations. The gang was made up of a Jewish boy, a Jehovah Witness, A mechanic and Jack who'd just got himself expelled from school. In 2015 three of the same g Jack MacKay narrates our story, told in part in 1965 when as a young lad he ran away from Glasgow with a group of friends to see if the streets of London were paved with gold. The boys were in a band and they were determined to make a name for themselves, all eager to see the bright lights and to remove themselves from various difficult situations. The gang was made up of a Jewish boy, a Jehovah Witness, A mechanic and Jack who'd just got himself expelled from school. In 2015 three of the same group of friends are on a mission to grant one of their number his dying wish, to return to London to right a wrong from many years before. In both time periods they meet a number of challenges, some of them almost farcical in nature and some that put intolerable strain on their friendship. It appears that we are in a time where writers are making older people their focus rather than the bit parts that they have traditionally been given, I'm thinking of Elizabeth is Missing by Emma Healey and The Girl Next Door by Ruth Rendell which I read last year, and Peter May really gets across how getting older can be a cause of regret, he doesn't gloss over unachieved ambitions but neither is this book all doom and gloom, giving a good balance by illustrating that there is a sense of the perspective gained by getting older as well as that old truth that in their minds the group may be older but they still feel the same as they've always done, just perhaps a little slower. Life's lessons are delivered to Rick, Jack's grandson who has been torn away from his twilight lifestyle gaming to act as the driver for the 2015 adventure. At first I found the narrative style, particularly of the 1965 trip off-putting as it is told by Jack looking back at this time and this inevitably means that some of the views felt way too old for the boy he would have been. There are political statements made about a range of issues including social housing, food banks, unemployment amongst others which made me feel like an elderly Uncle was lecturing me which I found disconcerting. As the story progresses and we find out the part the man who has been brutally murdered in 2015 played in the episodes from 1965, the narrative clicked and story felt more natural. The story is rescued from being entirely from a male perspective with a cousin of one of the group joining them in London. Peter May is a master at drawing a range of believable characters, and that is true in this book too with each member of the group drawn distinctly, I especially loved Jeff and his turn of phrase. As the book draws to a close there were a number of surprises for me as my conclusions proved way off the mark, as usual. This is a semi-autobiographical novel featuring some of Peter May's own escapades in London back in the sixties, and it certainly reads like an autobiography, although hopefully the crime committed is fantasy. As such there are references to the music of the time along with details of clothes worn that pertain would add a feeling of nostalgia if only I'd been born then. A mystery and a nice tale of friendships. In 1965, five young Scottish lads with dreams of fortune in the music industry run away to London. 50 years later, even if terminally ill, one of them urges them to go back once again. While they reminisce their brief but intense experiences on the road so long ago, the mystery of what happened to their tight group will be revealed. The book, as you would expect, alternates between flashbacks, where the author brings back the pop culture, music and atmos A mystery and a nice tale of friendships. In 1965, five young Scottish lads with dreams of fortune in the music industry run away to London. 50 years later, even if terminally ill, one of them urges them to go back once again. While they reminisce their brief but intense experiences on the road so long ago, the mystery of what happened to their tight group will be revealed. The book, as you would expect, alternates between flashbacks, where the author brings back the pop culture, music and atmosphere of the sixties, and the contemporary chapters, that are full of senior humor. The pace is great and there are many twist and turns in the story to keep the reader turning pages. The surprises keep coming till the very end. Moreover, finally!, a novel with a nice ending that is not too sweet. I enjoyed May’s Lewis trilogy books, but this standalone novel of his is the one I liked best. How could I have known then that failure of ambition is like a long, lingering death, and that disappointment with your life never goes away? It only grows stronger with the passage of time, as the clock ticks off the remaining days of your life, and any residual hope slips like sand through arthritic fingers. You don’t want to be looking back on it fifty years from now and wishing you’d done things differently. There’s nothing more corrosive than regret. Similar to the Lewis trilogy Peter May weaves a narrative over time and space, examining the same characters at two distant points in their lives and showing how the one influenced the other. But where May exquisitely links past and present in the Lewis books, Runaway is clunky, cliche ridden and forced. In a show of distain for his reader, no sooner do our protagonists arrive at their destination, for example, do they bump into not one, but two icons of the era - one of whom happens to be in the process of committing to celluloid the most iconic moment of his career. Are we really expected to swallow that as plausible, let alone likely? Similar events that occur throughout the book feel like unwarranted indulgences on the part of the author to relive his youth and demonstrate his musical chops. But this is lazy. Where he could have evoked London of fifty years ago through careful description of the mundane and profane, he has instead chosen to slap on a massive sign saying "Look, the Rolling Stones are on the Dancette, it must be the sixties!" Caricatures and lazy stereotypes in the lives of the characters persist throughout the book: the altercation between the main character and his love interest over her use of Heroin and her subsequent, almost effortless, cold turkey; the tripped out kid who thinks he can fly; the improbable job offer; the adoption of the characters into a bohemian collective mere hours after their arrival in London; the abandonment of the Glasgow end of the storyline half way through the book; the arrival of an antagonist out of nowhere to precipitate the event that is presumably the whole point of the story but which feels like an afterthought; and even the denouement, ultimately all ring false. In 1965 Jack Mackay is seventeen. When he’s expelled from school in Glasgow after a school dance, he decides that running away to London is a good idea. Jack and his friends, Maurie, Luke, Dave and Jeff are members of a band called ‘Shuffle’, and together they decide to abandon Glasgow for musical stardom in London. In 2015 Jack Mackay is sixty-seven, living back in Glasgow, and haunted by memories from 1965. His friend Maurie, terminally ill, sees a report of a brutal murder in the local newspaper. Returning to London to face the past is what he wants to do, and that is what he does, together with Jack, Jeff and Jack’s grandson Ricky. So what happened in 1965? And what is the point of their trip in 2015? The novel moves between 1965 and 2015, between young confident men who learn that the world is not as nice a place as they thought, and older men trying to face up to events they’ve spent half a century running away from. And while the older men learn, Ricky is also finding his own place in the world. I’ve read four of Peter May’s novels so far, and enjoyed each one of them. There were a few twists that I didn’t work out in this novel until close to the end: I suspect that I was too busy reading to find out what would happen next rather than paying close attention to the detail. This is a very quick read. It's described as a thriller but it's more of a "road story" with a group of friends making a journey to London in 1965 and again 50 years later in 2015. On both trips there are misadventures, sometimes downright scary. On the second trip, 2 of the friends aren't with them, having stayed in London 50 years before. A lot happens in the last 10 pages which neatly wrap up the story and make it a thriller. I wavered as I began this but became utterly enmeshed. I thought the shift from the old men going back to the young bucks of the 1960s seeking individuality and back and forth through the book was an excellent device, with the addition of the young buck-that-really-wasn't attached to the old men and slowly coming alive and into focus as the story developed. I am much impressed by this storyteller. So do you remember where you were 50 years ago? These aging lads do – but they do not seem completely sure of how and why they have gotten to where they are. Welcome to the convoluted world of these former band mates as we bounce between 1965 and 2015. "Five of us had run away that fateful night just over a month before. Only three of us would be going home. And nothing, nothing would ever be the same again." Glasgow, 1965. Headstrong teenager Jack Mackay cannot allow for even the possibility of a life of predictability and routine. The seventeen-year-old has just one destination on his mind--London--and successfully convinces his four friends, and fellow bandmates, to join him in abandoning their homes to pursue a goal of musical stardom. Glasgow, 2015. Jack Mackay dares not look back on a life of failure and mediocrity. The heavy-hearted sixty-seven-year-old is still haunted by what might have been. His recollections of the terrible events that befell him and his friends some fifty years earlier, and how he did not act when it mattered most is a memory he has tried to escape his entire adult life. London, 2015. A man lies dead in a one-room flat. His killer looks on, remorseless. What started with five teenagers following a dream five decades before has been transformed over the intervening decades into a waking nightmare that might just consume them all. Runaway is a tense crime thriller spanning a half-century of friendships solidified and severed, dreams shared and shattered, passions ignited and extinguished, all set against the backdrop of two unique cities at two unique and transformational periods of recent history. 31: Flats that, once renovated, are still lived in today, while those they built to replace them have long since been demolished. 39: …Jeff was a happy go lucky, simple sort of lad, but he had a stubborn streak in him that marbled gneiss. 64: Jack nodded ~ We can leave them a note on your pillow, son. And don’t worry about it, they’ll blame me. Everyone always does. 65: The only thing we learn from history is that we never learn from history. 101: It is astonishing how youthful ignorance can put adversity so easily aside to breed baseless optimism. 169: …dilapidated terraces mean and blackened by smoke, ugly high-rise flats, and factories pumping their poison into a cold grey sky. London had not earned its moniker of the Big Smoke for no reason. 170: The streets of London were not, as in legend, paved with gold, but money walked the pavements and motored the roads. 199: You felt in control of that (dope). But an acid trip seemed random, and utterly dependent on your mood to determine whether it would be a good or bad journey on the road to paradise or psychosis. 218: Trouble is, most psychiatrists like the sound of their own voices too much, it’s what the patient has to say that’s important. Listening is the virtue. 230: …by the bomb that Rachel dropped…. 295: Only three of us would be going home. And nothing, nothing would ever be the same again. 299: Times have changed, Rick. Not sure how or why. Some we have permission to show our emotions, these days. So I went back to a life shaped by fear…and that’s the biggest crime you can commit in life. Rick. To be afraid of living it. 300: There’s nothing more corrosive than regret. 322: …before they hear the shot. A single shot, clear and pure, like Maurie’s voice had been once. The book begins with a murder in 2015. We don't know the identity of the killer or victim until much later in the book. Everything starts to go horribly wrong for them from the beginning of their road trip. Finally disillusioned, dirty and e The book begins with a murder in 2015. We don't know the identity of the killer or victim until much later in the book. Everything starts to go horribly wrong for them from the beginning of their road trip. Finally disillusioned, dirty and exhausted, and with very little money, they arrive at their destination. In London their hopes for a music career are dashed and they fall in with people who claim to have connections with the entertainment business. They stay at a place where alcohol and drugs are available. After adventures and misadventures in London, three of the bitterly disappointed young men return to Glasgow. We meet these three 50 years later. It is now 2015, and their former lead singer, Maurice, is near death in hospital. He has read about the murder in a newspaper and demands that the two old friends and former band mates, Jack and Dave, help get him back to London, as he has some unfinished business connected with the murder relating back 50 years to their time in London. The friends know nothing about what Maurice knows or plans. They are told to trust him. With the reluctant help of Jack's grandson, they start out for London. The grandson is enlisted to break Maurice out of hospital and to help him move as he so weak and sick he can barely walk. With the grandson driving, a lot goes wrong on their way to London. There are flashes of humor among all the tragedy. Peter May has done it again. He’s created yet another thrilling read, one that pulls you in from the start until the end. I’ve worked through most of his books now – I have Coffin Road and all except the first of the China Thrillers to catch up on (the list being longer than I’d like) – and I can honestly say I have yet to be disappointed. The Enzo Files weren’t quite what I had been hoping for, yet they were still fun. None of them have managed to live up to the brilliance of the Lewis trilogy, Peter May has done it again. He’s created yet another thrilling read, one that pulls you in from the start until the end. I’ve worked through most of his books now – I have Coffin Road and all except the first of the China Thrillers to catch up on (the list being longer than I’d like) – and I can honestly say I have yet to be disappointed. The Enzo Files weren’t quite what I had been hoping for, yet they were still fun. None of them have managed to live up to the brilliance of the Lewis trilogy, but I’ve still be pleased with them all. With Runaway, we have his usual four-star standard. Runaway, when compared to his other books, is slightly less of a mystery. There is still a mystery aspect to the book; however, I felt it was more a tale of growing up. The story of finding yourself. Coming to terms with who you are. Facing your past. In part it was a coming of age novel, yet at the same time it was a reflection of life. It was a great tale of life, bringing about the young and the old to demonstrate how life events can have a lasting impact. Despite how the mystery aspect was pushed behind the story of life, it was still an interesting mystery. As you worked through the story it became painfully clear how certain things were to end, yet you did not have the specifics. The specifics were what you were holding out for, curious as to exactly what would happen to each of the characters. This is the second excellent book I have read in as many days. I thoroughly enjoyed the books I had previously read by this author and was eagerly looking forward to this book and wow. The book is so much more than a whodunit, it is full of great characters and lots of emotions. Peter May brings his characters to life and you feel every emotion while reading his books. I loved this book from start to finish and was sad when I actually finished it. Mé hodnocení těsně po dočtení předtím, než seberu myšlenky k řádné "recenzi": Peter May na jednu stranu ukázal, že dokáže čtenáře přikovat ke knize, která je v zásadně dost nudná. Umí vyprávět příběh, přestože je příběh mimořádně strohý. Na druhou stranu od tohoto autora očekávám něco jiného; možná nespravedlivě ho mám ve škatulce autorů detektivek, nebo minimálně knih, kde je notná dávka napětí. To se zde nekoná. Je to vlastně knižní road-movie. Více později. For me the best Peter May book to date, In places dark and intriguing. A social history. Very thought provoking and in many ways feels to be autobiographical in the writing Peter May will no doubt have left something of himself in this book. A deep well written story that shows the versatility of this author. This one is for the men with memories of the 60's along with those dreams of making it with a band. Glasgow is where a group of teens grew up and meshed and from where they ran away to live a dream in London. There are bumps in the road and holes in their plans and resources, and from this telling I can't say there were any successes to report beyond that first youthful taste of freedom and intense feelings. After some difficult situations the group of friends returns to Glasgow minus two - one This one is for the men with memories of the 60's along with those dreams of making it with a band. Glasgow is where a group of teens grew up and meshed and from where they ran away to live a dream in London. There are bumps in the road and holes in their plans and resources, and from this telling I can't say there were any successes to report beyond that first youthful taste of freedom and intense feelings. After some difficult situations the group of friends returns to Glasgow minus two - one who wished to stay rather than return to his family and one who believed he could fly while under the influence. Rok 1965. Pięciu nastolatków zakłada zespół muzyczny i postanawia uciec z Glasgow do Londynu, ale od samego początku wszystko idzie źle. 50 lat później, gdy w gazecie pojawi się artykuł o pewnym morderstwie, starzejący się i schorowani uczestnicy tamtej wyprawy wyruszą jeszcze raz, po swoich śladach sprzed lat, tropem tragicznych i zagadkowych wydarzeń z przeszłości. Nie mam pojęcia czy to jest dobry kryminał, nie znam się :) ale na pewno jest to świetna książka o dorastaniu, przyjaźni, miłości - Rok 1965. Pięciu nastolatków zakłada zespół muzyczny i postanawia uciec z Glasgow do Londynu, ale od samego początku wszystko idzie źle. 50 lat później, gdy w gazecie pojawi się artykuł o pewnym morderstwie, starzejący się i schorowani uczestnicy tamtej wyprawy wyruszą jeszcze raz, po swoich śladach sprzed lat, tropem tragicznych i zagadkowych wydarzeń z przeszłości. The year is 1965 in Glascow Scotland. Jack MacKay has been expelled from school. He decides to run away to London. His band mates named The Shuffle decide to run away with him. This decision changes their lives forever. They experience more in a little over a month than most people would experience in a life time. The year is 2015. A grisly murder has occurred in London. Maurie who is terminally ill tells Jack as he want to return to London as this murder was tied to their time there. He knows wh The year is 1965 in Glascow Scotland. Jack MacKay has been expelled from school. He decides to run away to London. His band mates named The Shuffle decide to run away with him. This decision changes their lives forever. They experience more in a little over a month than most people would experience in a life time. The year is 2015. A grisly murder has occurred in London. Maurie who is terminally ill tells Jack as he want to return to London as this murder was tied to their time there. He knows who the murderer is and want to settle this before he dies. It seems like am impossibility to get Maurie back to London due to his health. First they have to get him out the hospital or care home. Dave, another band member, who now drinks heavily and Jack's grandson go along. Rick, the grandson, starts to see his grandfather in a new light. He did not want to make this trip but it is a coming of age experience for him. I was given an advance review copy by Midas Public Relations in exchange for an honest review. This was my first time reading Peter May. I now have an author to add to my list of must read’s. I liked the way Peter May structures Runaway. The story moves back and forth between 1965 and 2015. I liked the sense of anticipation and tension this created. May gradually drip-feeds what happened to Jack and his friends in 1965 rather than revealing everything in one go. I had to keep rea I was given an advance review copy by Midas Public Relations in exchange for an honest review. I liked the way Peter May structures Runaway. The story moves back and forth between 1965 and 2015. I liked the sense of anticipation and tension this created. May gradually drip-feeds what happened to Jack and his friends in 1965 rather than revealing everything in one go. I had to keep reading Runaway to join all the dots. I love it when author’s use time shifts so effectively. Runaway kept me guessing until the end. All my guess work about what happened in 1965 was way off. I love it when a writer takes me by surprise and May does this over and over again in Runaway. I had no clue where the story was going to lead. The ending brought tears to my eyes. I enjoyed every page of Runaway. If his other novels are half as good I’m in for a treat. This was an almost random grab off the library shelf, so I didn't know what to expect. A couple of chapters in, I didn't think I was going to like it, but it was one of those books that the further into it I got, the more absorbed I became in the story. An interesting look at how our views change - and how they remain the same - as we age, coupled with a well-told story.